You know those women who glide through their pregnancy looking fabulous in skin-tight singlet tops, contrasting layering thingies and low-slung jeans? That was never me. I’m not one for anything form fitting at the best of times, let alone when I was pregnant. But nor did I want to wear a muumuu. 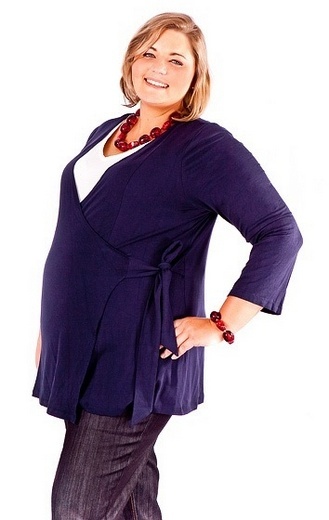 Mainstream fashion is slowly catching up with the plus size market in Australia but what of maternity wear? We all know that for the most part, simply buying bigger clothes is not a maternity wardrobe solution – the fit is all wrong. Recognising a gap in the market, Nadine Newell started Plus Maternity. Plus Maternity caters for plus sized women during their pregnancy and beyond (let’s face it, no one walks out of hospital wearing their pre-pregnancy jeans!). The collection is made up of versatile basics – classic bengaline pants, jeans, t-shirts, long-sleeved tops and a selection of accent fashion pieces – wrap tops, a sequin singlet for eveningwear and a tie-front jacket. There is also sleepwear and swimwear available. The styles are flattering and small details make the difference – pleats and gathers are in the right places, tie-front jackets and wrap tops adjust to growing bellies, many tops are ‘breastfeeding friendly’ and pieces can easily dress up or down for a corporate or casual look. Newell provides plenty of ideas on how to mix and match individual pieces as well as guidelines for putting together a capsule maternity wardrobe. All of the pieces are designed and made in Australia and prices range from $49.95 for a basic stretch singlet top up to $139.95 for a Merino tie-front wrap. Jeans, the wardrobe staple, are $99.95. The collection is available online directly from Plus Maternity, who ship Australia-wide. Once you’ve got your maternity basics sorted, make a style statement regardless of your size with a few pointers from Bump It Up, a book we reviewed previously on Babyology.